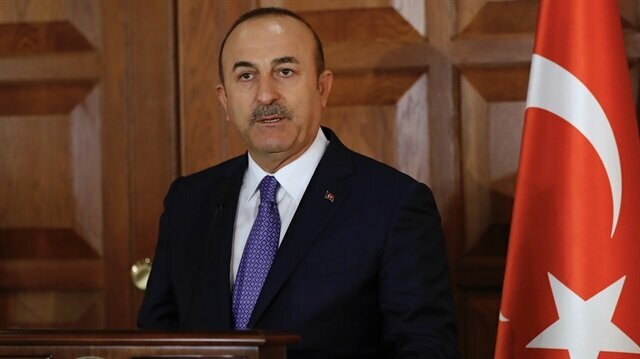 Foreign Minister Mevlüt Çavuşoğlu said Monday that Turkey could start drilling in the Eastern Mediterranean this autumn as the country had already purchased a platform. Speaking at a joint news conference with his Turkish Cypriot counterpart Kudret Ozersay, Çavuşoğlu said the Turkish Republic of Northern Cyprus (TRNC) has territorial waters and a continental shelf which Turkey would take all measures to protect. Turkey is on full alert in the Eastern Mediterranean with the launch of Russian military drills and U.S. destroyers equipped with Tomahawk missiles turning toward the region as an offensive in Syria’s last opposition-held stronghold of Idlib looms.The Russian defense ministry said that more than 25 warships and support vessels and around 30 planes, including fighter jets and strategic bombers, would take part in the Mediterranean drills which it said would last from Sept. 1 to Sept. 8.Upon these developments, Turkey, which previously had 10 warships in the region, dispatched several more naval vessels to the region, the exact number of which is unknown.Turkey has numerously expressed its objections to an Idlib offensive, saying it would lead to disaster, and is taking every precaution to protect its rights and interests in international waters.US sees assault on Idlib as escalation of Syria conflict: PompeoGermany warns of ‘catastrophe’ in Syria’s Idlib'Turkey essential to preventing bloodbath in Syria’s Idlib’U.S. aggression against SyriaAnatoly Antonov, Russia's ambassador to the United States, warned Washington on Thursday against what he called "groundless and illegal aggression against Syria." Antonov said he had told U.S. officials Moscow was concerned by signs that the United States was preparing new strikes on Syria.Warships at the readyThe U.S. and NATO allies such as the U.K. and France are keeping their navy ships in the Mediterranean on full alert. The Russian Defense Ministry said U.S. destroyers Karni and Ross will be ready to strike Syria within 24 hours. On Saturday, U.S. navy ship USNS Carson City T-EPF-7 reached the Mediterranean from the Dardanelles Strait. The U.S. had previously struck Syria by having warships deployed in the Mediterranean, Red Sea and the Basra Gulf fire missiles at Syrian regime targets. Though not directly linked to the developments in Idlib, Turkey’s ramped-up presence in the Mediterranean aims to prevent a fait accompli in Turkish waters with regards to issues of security and energy. Countries such as Russia, the U.S., U.K., France, Germany, Israel, Egypt, Greece and Italy all maintain a navy presence in the Mediterranean.The United Nations has called on Russia, Iran and Turkey to delay a battle that could affect millions of civilians.Russia and Turkey, along with Iran are sponsoring the Astana peace talks, which focuses on a cease-fire and ending the seven-year civil war in Syria.Syria’s civil war has cost an estimated 400,000 lives, displaced more than 11 million people and led to a severe shortage of food, clean water and healthcare. Çavuşoğlu added that he will also meet his Greek counterpart Nikos Kotzias on Tuesday in the Turkish province of Izmir and discuss the Cyprus issue. He said if the Greek Cypriot side continues taking unilateral steps, Turkey will start drilling activities. Russia set for first post-Soviet military drill in Med. Ozersay also reiterated that if Greek Cypriots will continue unilateral drilling activities, Turkish Cypriots will also "start drilling soon" in accordance with the license it had already provided to Turkish Petroleum.